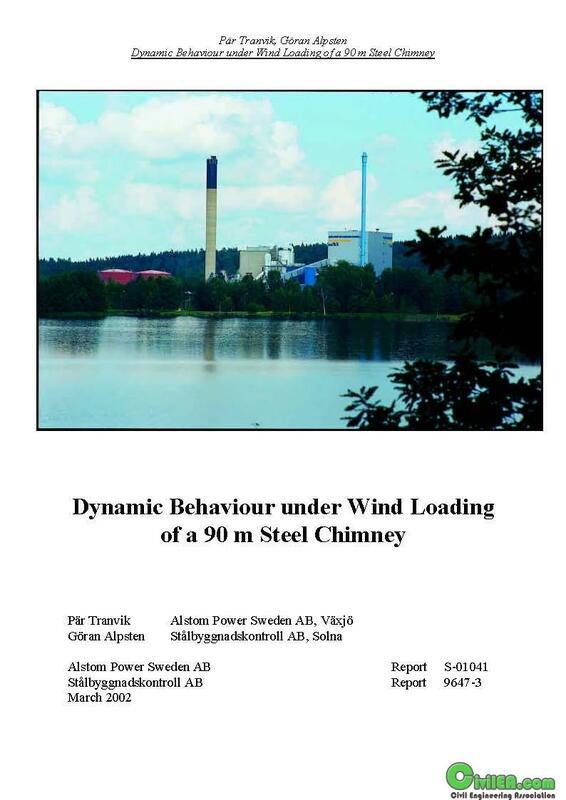 This report presents results from an investigation of the structural behaviour of a 90 m high steel chimney equipped with a mechanical damper at the top. Due to a mistake in installing the chimney the damper was not active in the first period of service life, causing large oscillations of the structure and fatigue cracks to occur within a few months of service. Because of this an extensive investigation was started to rectify the action of the damper, repair the steel structure and to monitor the behaviour of the structure adopting a fail-safe principle. Data from four years of continuous measurements are presented in the report. VEAB of Växjö, Sweden is owner of the chimney, being part of a delivery of an electrostatic precipitator of the Sandvik II biomass power plant at Växjö. ABB Fläkt Industri AB of Växjö was contractor for the electrostatic precipitator including the chimney (activities of the company later subdivided between Alstom Power Sweden AB and ABB). The chimney was fabricated and erected by the subcontractor VL Staal A/S of Esbjerg, Denmark. The authors are indebted to all parties involved for making it possible to present the results in this form. Special thanks are due to Mr Ulf Johnson of VEAB, Mr Lars Palmqvist of ABB Automation Systems AB, Mr Stig Magnell of Dryco AB, Messrs Rolf Snygg and Thomas Väärälä of Alstom Power Sweden AB, and Mr Stig Pedersen of VL Staal A/S. The investigation presented in this report was initiated by VEAB, for which the second author acted as a consultant. The compilation of data and preparation of most parts of this report were made by the first author. The second author has acted mainly as advisor for the investigation.